For Peter Diamandis, boring old “space” just isn’t good enough anymore. After his foundation’s X Prize competition resulted in the first non-government manned space mission in world history, Diamandis apparently needs more. Last week, the X Prize Foundation released the draft rules governing its new $2 million Lunar Lander Challenge. The competition has been designed to simulate the demands of a lunar voyage, including a landing and return flight. 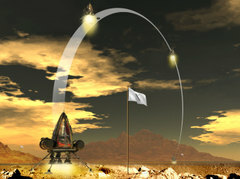 The rules for the most demanding of the two contest divisions call for a rocket-powered craft to take off, maintain a steady altitude for 180 seconds, then land at a second point simulating the lunar surface no less than 100 meters away. Teams will then have 30 minutes to refuel their craft before launching it again from the landing point, flying it for another 180 seconds before landing it at the initial launch area. Since Gene Cernan and Harrison Schmitt pulled in the ladder on Apollo 17 in 1972, only a handful of spacecraft have touched down on the moon’s surface—none of them carrying human passengers. And while the competition rules do not call for living cargo, a privately-funded trip to the moon is slowly beginning to sound less like the ravings of 1950s pulp science fiction and more like an attainable reality. (Since PopSci last covered Space Adventures CEO Eric Anderson’s lunar tourism dreams, his company has announced plans to build private spaceports in Singapore and the United Arab Emirates). How much loon turists pay now for the trips? UGG Gloves make your hands warm in winter. Here you can own your best UGG Gloves with the lowest price.